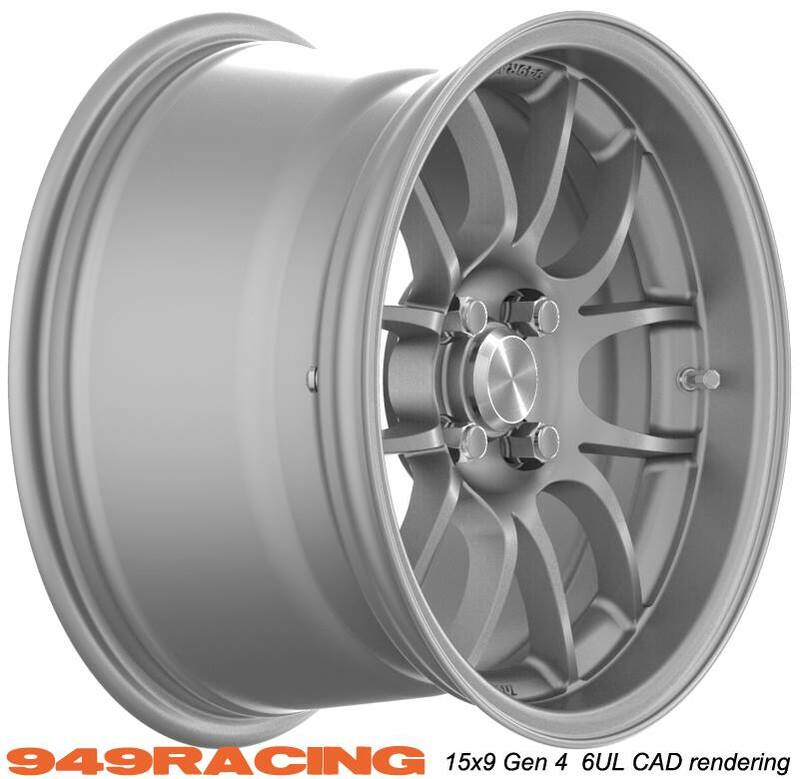 949 Racing 6UL CAD renderings - Miata Turbo Forum - Boost cars, acquire cats. 15x8 going into production in a few weeks. Accepting pre orders on our website late June. Shipping late August. 11.3 lbs. A few design notes. We have incorporated TPMS compatibility in all Gen 4 6UL's. Some manufacturers are upping max load to 550kg for some widths in 4x100 but not others. We are adding 10% to the industry standard VIA max load rating for every new 949 Racing wheel. We call this Spec949. For reference, VIA standard for 4x100 is 500kg. I personally liked the slightly sharper spoke edge on the Gen 1's over the Gen 2 and Gen 3 wheels so we brought that back for the Gen 4. Tiny difference but I think it defines the wheel a bit. We have retained 11" Dynalite BBK clearance. We will publish brake templates when we open the site for pre-ordering for each size. It is unknown how they will clear 11.75 Powerlite and DP4 kits until we can get templates for them (Keith, Andrew?). The few gen 3 wheels you see on our website in the closeout section are crash replacement only. IOW, you have to be a previous customer to order them. Tungsten is a new color? Picture links seem to be broken. they always are because the forum is like that. For some reason, the auto-attachment for vendors is broken. Possibly. We will see what the samples look like. If we add Tungsten gray, it will be at the same time as the other colors are released. So, no guessing if it will be added later. Coming 2015 to a dealer near you! Who's holding the bets on what comes first, these or TECNAs? I like the slightly sharper spokes look. 15X11? That's gonna make some people very happy. I now regret not tubbing the rear when I had the chance. Looks great....love the addition of 15x6 and 15x11. Stoked for 8s and 9s this year. Last edited by Filipe Dias; 06-08-2014 at 08:20 PM. Now are you still going to keep developing products like I really want in a timely fashon? I’m in really bad need of a 6 speed box with good ratios that will hold a bit over 300ft-lbs. Broke OEM 6 speed #4 now, this time broke second gear in it. I’ve discovered 275 Hoosiers on 15X11 wheels on a 70 degree day have a lot of grip in every direction Transmissions fear that much grip in my car. It's not up to me. I issued the request, PO's, deposits and sometimes, engineering drawings. The suppliers over promise on delivery dates. Always. The irony is that even when talking to the actual engineers at Hoosier, I was told (emphatically), that the 275 only needed a 10" wheel. Like you, when I saw the 245 on our 15x10 (perfection, BTW), I knew I needed to do an 11 for the 275 someday. Super low volume wheel though, and I have many other fish to fry. So it will happen when it happens. 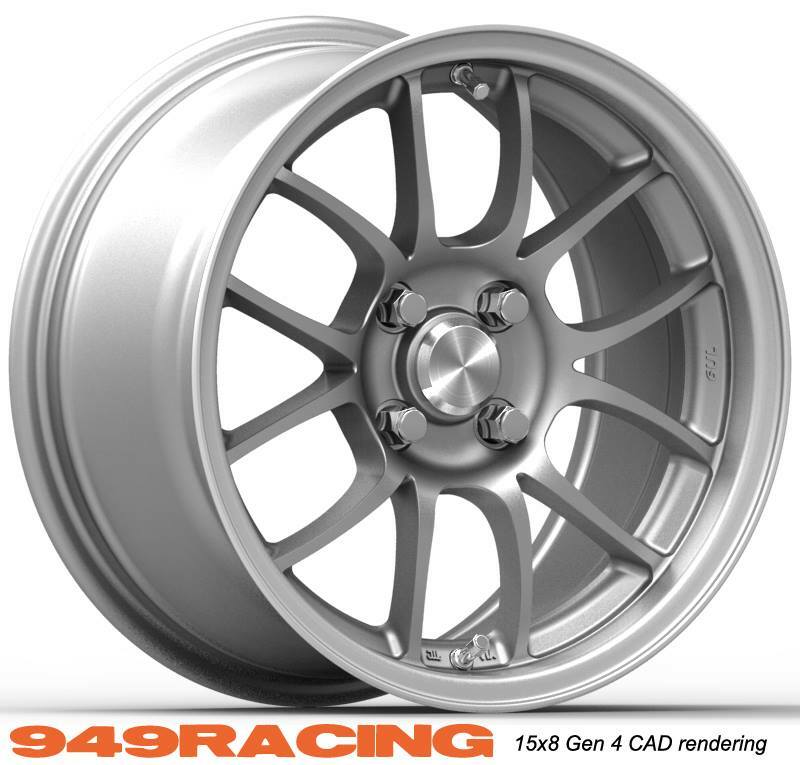 Well the thing is nobody makes a 15X11 that isnt a one off custom wheel that cost a small fortune. First one to market with it might do well now that a bunch of other manufacturers are now following your lead into the 8,9,10 market. I also think the market for 6UL's would be bigger if they could be kept in stock but I suspect that is hard to match production and demand.